Every fisherman knows the hassle of transporting fishing rods from storage to that secret fishing spot. 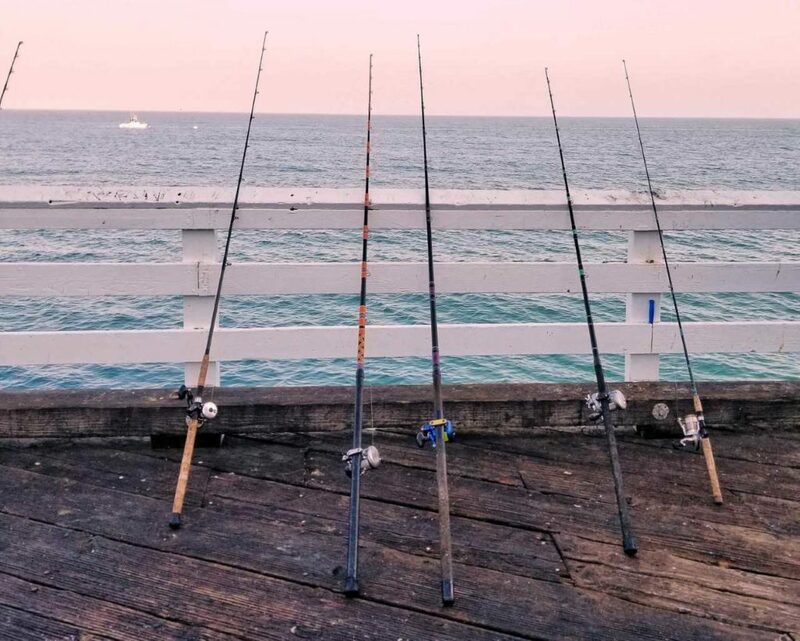 Whether it is a quick trip down to the surf, or an arduous fishing trip halfway across the country, the most important question an angler has to ask themselves is how to get their fishing rods from Point A to Point B safely and effectively. The consequences of failing to do so does more than just ruin a fishing trip. It costs time and hard-earned cash to replace broken fishing rods which more than likely also have sentimental value. Another factor to keep in mind when transporting fishing rods is theft protection. With some fishing rod combos costing upward of a thousand dollars, theft when stopping to fill up the gas tank or grabbing a bite to eat is a very real possibility. The best thing an angler can do to ensure this doesn’t happen to them is to have a game plan set up to safely transport and store their rods. Most breakage or rod loss does not occur on the water or in the garage but instead during transit in a vehicle. 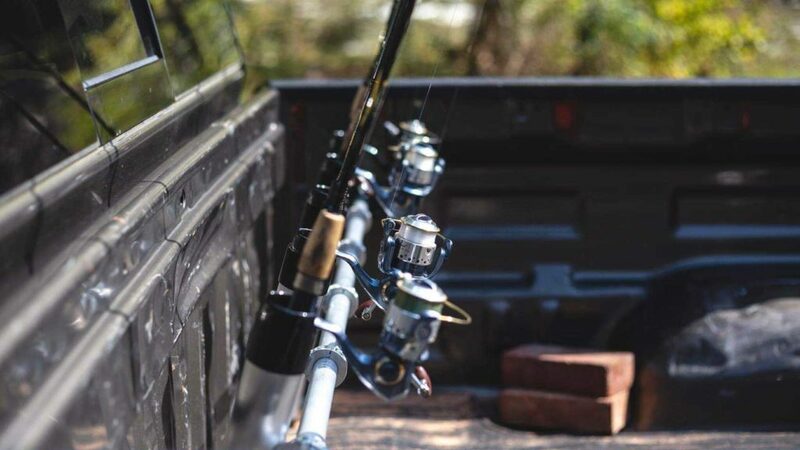 There are several ways to transport fishing rods in a vehicle, with some options being safer than others, as well as some special considerations to the type of vehicle you own. Rod wraps essentially are a way to bundle a few rods together to make the transit to and from a location easier. A wrap around the base of the combos holds them securely together. While a rod wrap allows for easy transit from the garage to vehicle or boat, it is not recommended to travel with only a rod wrap. Breaking a rod is a strong possibility and not just with one rod but potentially all within the wrap. 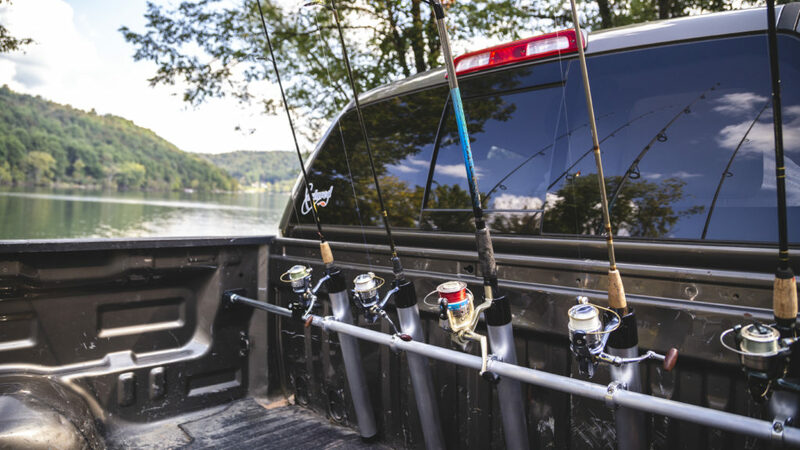 The length of the rod is exposed to other fishing gear you may have in your truck bed. Or in the case of a car or SUV, the rod tips are up by the driver’s center console and within easy elbow-smashing distance. However, if you are looking for a quick way to move many rods at once, a rod wrap is a great way to go. 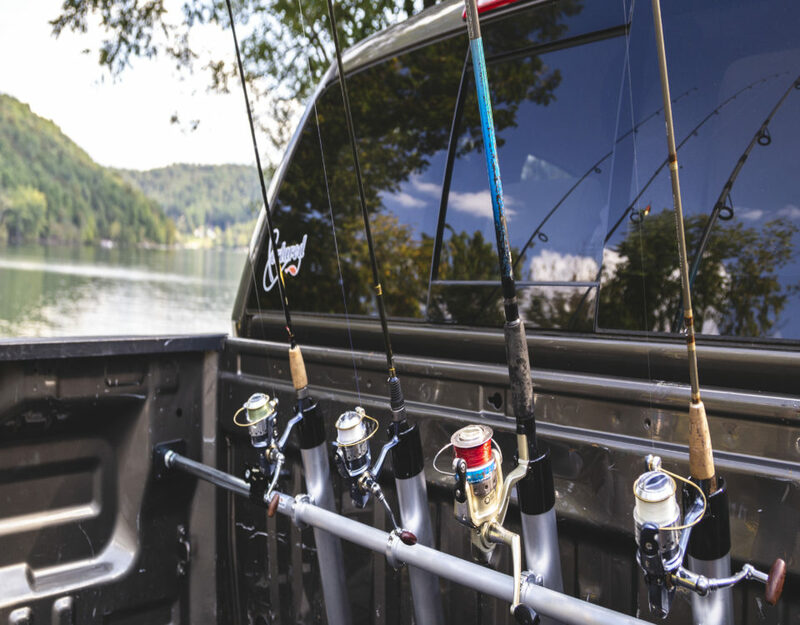 Fishing rod racks that go on the interior of a vehicle are a good option to get rods up and out of the way when driving to a fishing spot. Bungees that span the width of a car are hung up and secured. The rods then rest on top of the bungees. This system allows you to put other fishing gear or passengers in the vehicle without the worry of breaking a rod. Interior roof rack systems may be the best way to transport fishing rods with an SUV. However, with the length of rods, especially for off-shore or muskie fishing rods being in excess of 9 feet, an interior roof rack option might not be feasible. Also for anglers with trucks who have little roof cab space, an alternative way to transport fishing rods should be considered. Rod storage tubes with a hard shell are another way to transport rods. They don’t just provide protection in a vehicle, but also to and from the water, or in long-term storage. Hard storage tubes are also recommended for those who wish to fly with their rods. Though, if you wish to use a hard-shelled storage tube in a vehicle, make sure to find a way to secure it. They are notorious for rolling around in truck beds if not secured properly. Keep in mind, depending on the length of the rod tube in comparison to the length of your truck bed, you may have to leave the tailgate down. This leaves valuable equipment vulnerable to theft or the possibility of falling out if not secured properly. Roof-mounted rod tubes are much like the portable rod storage tubes in their structural design. The difference is that the cylindrical tube is affixed to the roof rails securely. This eliminates the need to secure the tube every time in a truck bed or leave a tailgate down. They are a great way to protect valuable rod combos but keep in mind if you have a fishing kayak or other roof rail storage, a roof-mounted rod tube may not fit. If you do not already have roof rails, buying some specifically for this type of fishing rod transportation could get expensive. There are many DIY builds out there that can be made out of PVC pipe and other materials to help cut down on cost but the time to do so should be considered. 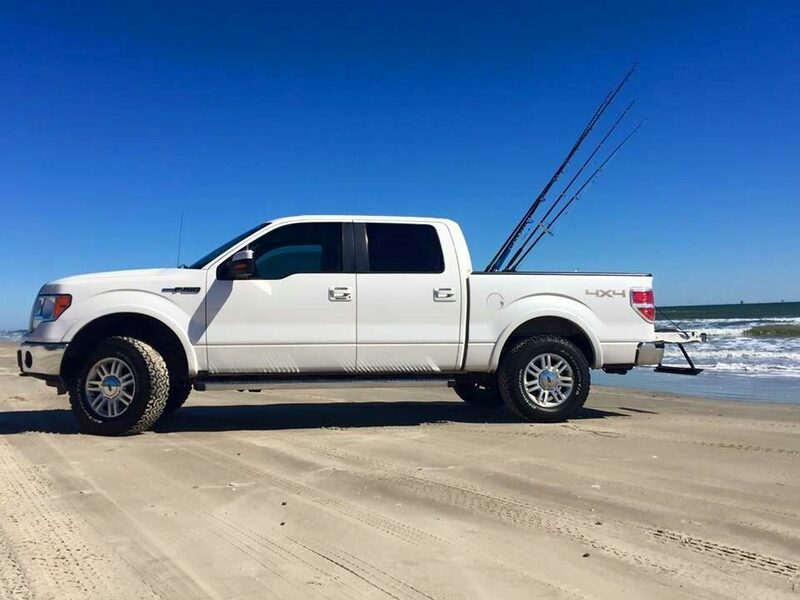 If you are an angler who owns a truck, transporting fishing rods can be an extra challenge. Many rods will not fit in the cab due to their length, or stay safe in a truck bed with other gear moving around. The safest way to transport fishing rods in a truck is with the Portarod. 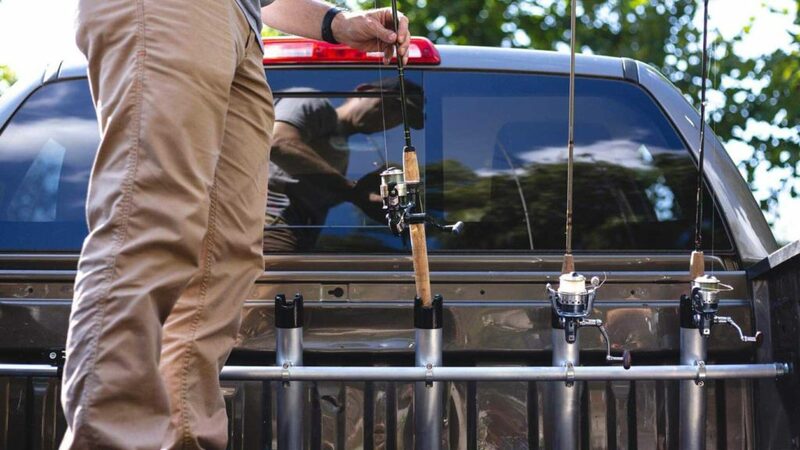 The Portarod is a cost-effective, durable truck bed rod holder that is held securely in place by tension and does not require you to drill into the truck bed. The system is a fully customizable rod storage option that allows you to add more rod holders as needed, with the ability to adjust the angle of the rod holder. This feature eliminates the issue of having long off-shore rods that will not fit in other rod transportation options. 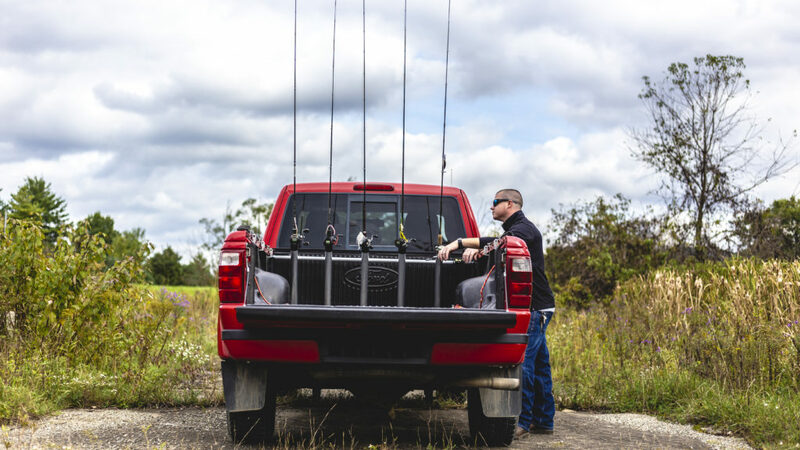 The Portarod also frees up space in the truck bed for other fishing gear without the possibility of harming your fishing rods. They are secured in the rod tube out of the way—leaving you with more space. With theft being a large concern for anglers traveling with their rods, Portarod solves the problem by making custom locks that fit around the base of your fishing rod combo and the fishing rod holder. This is a great option especially if you wish to travel with more rods than you need as a backup without worrying about them not being there after a long day fishing. This is also a great option if you’d like to pack the night before a fishing trip to be on the water early. 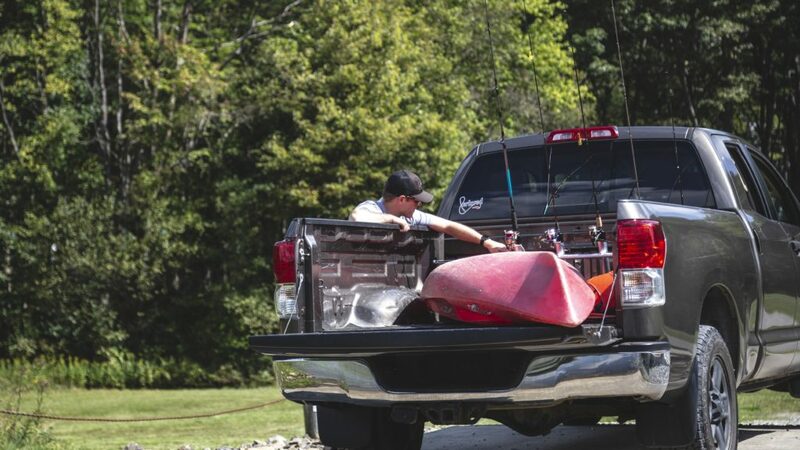 The Portarod’s features make it the safest way to transport fishing rods in a truck bed. 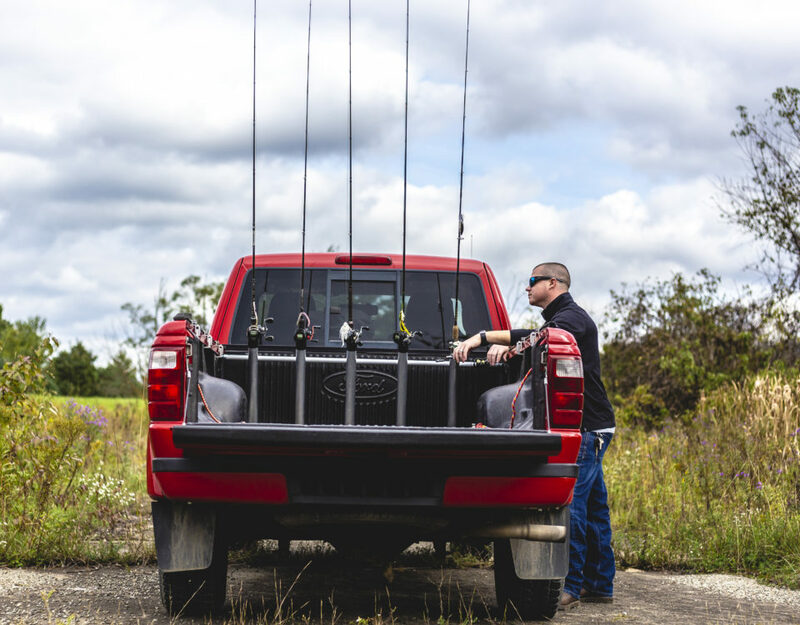 Transporting fishing rods can be a hassle, but with knowledge of the best options on the market, an angler can ensure their hard-earned fishing rods are safe and secure to every fishing spot. Transporting fishing rods and kayaks with one vehicle? Check out our blog on kayak fishing!